Mexican food is delicious, but certain deep-fried or cheese-laden dishes are notoriously bad for your health. If you’d like to make healthier choices at a summer fiesta, choose dishes made with fresh vegetables, seafood, fruits and beans. 1. Make fresh salsa or black bean dip instead of guacamole. Guacamole is rich in healthy fats, but it is much higher in fat and calories than salsa or black bean dip. 2. Choose lean meats and don’t add fat when cooking. Consider using lean ground beef, lean ground turkey, shredded chicken breast or fish in your recipes. And choose liquid oils when cooking instead of using animal fats like lard and butter. 3. Use fresh beans or choose a fat-free option. Make re-fried beans from scratch or buy a fat-free canned version. When using canned beans, rinse them before using to remove excess sodium. 4. Use cheese and milk-based products sparingly. Take it easy on the cheese, or choose non-fat dairy such as non-fat sour cream and non-fat cheese. 5. If drinking alcohol, choose a lighter option. Instead of margaritas, consider light Mexican beer or a dry wine. And only drink in moderation. Have a plan. Before you dine, check the restaurant menu’s nutrition information online. Know the healthy lingo. Scan the menu for terms like ‘healthy options’, ‘less than 500 calories’, ‘Weight Watchers’, or ‘low fat’. Control your portions. Restaurant portions are typically larger than the portions we should be eating. Just by cutting back on the amount of food you eat, you also cut back on calories. 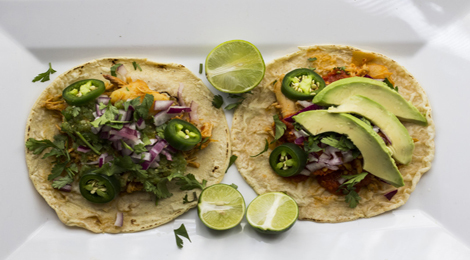 Share with an amigo or save some for later! For more helpful, healthful tips, click here. 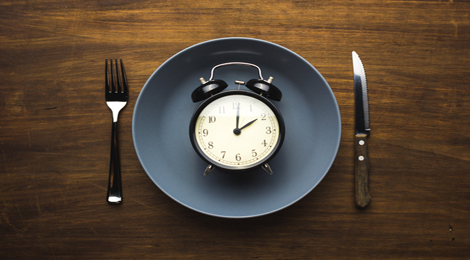 Does intermittent fasting help you lose weight? What happens to the body when you skip meals?